Studio view of Corner, Multi-plate Reduction Woodcut Mono-prints on Birch Panel, 142 x 98 inches, 2012-2014. Photo courtesy of the artist. The word chrysalis alone is an unmistakable indication that here two dreams are joined together, dreams that bespeak both the repose and flight of being, evening’s crystallization and wings that open to the light. In the body of the winged manor, which dominates both town and sea, man and universe, he retained a cottage chrysalis in order to be able to hide alone, in complete repose. I remember walking through a forest of symbols. Confused words in several languages echoed, and I noticed seemingly familiar glances as different locales swirled round. I found no semblance of the familiar, and I understood neither a beginning nor an end. I seem to have emerged from a place with no past nor future, no clear language nor signification. I was in some kind of container, a delicate shell of sorts. While there, I saw dreams join and I observed them all, all at once. And at the origins of knowing, the onset of symbolic forms communicated to me, and I experienced how memory functions. 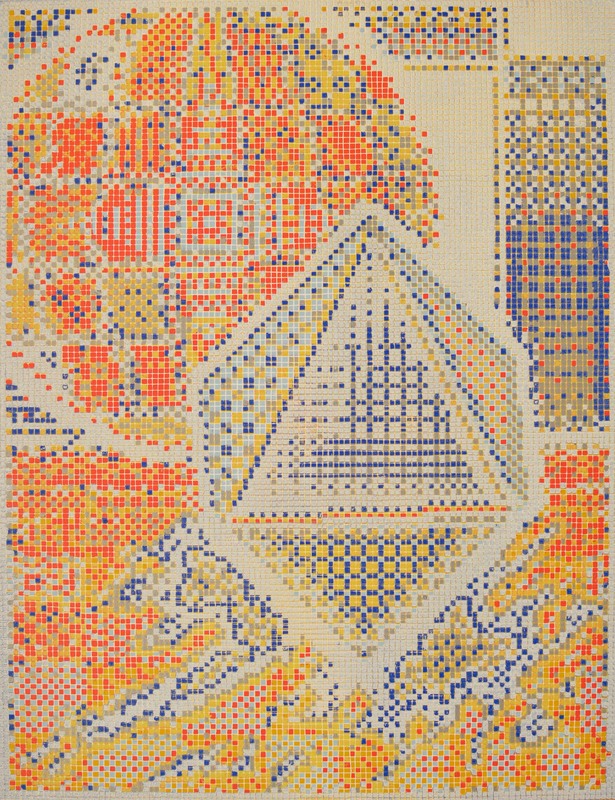 Alexis Hugo Nutini, 16,352, Reduction Relief Mono-print, 30 x 38 inches, 2014. My imaginative journey began standing within Alexis Hugo Nutini’s new exhibition Chrysalis, an intimate study of how the memory of the places we have lived or visited informs our perception of self. For Gaston Bachelard, the home, with its nooks and coves, held memory’s refuge and was the place where recollection and imagination were associated. For Nutini, the chrysalis is the shell of origin and a literal and metaphorical container that, in his words, “…you can think of it as a development; you can think of it as just a thing, as a specific stage…” or a primordial moment. Composed of remnants of symbolic imagery and geographic references, Chrysalis is rich with reduction-woodcut and reduction-relief mono-prints, generating an intense conversation of color and oil-based ink texture. Upon entering the gallery, we are met with the installation Corner (2012-2014) made of a series of reduction-woodcut mono-print fragments, each cut from a once whole image and pressed onto birch panel. Nutini cut full prints into parallelogram-like shapes and aligned the images on the wall so the spaces in between them create the orthogonal lines of a perspectival space, and the wall gives way to another room’s edge. In the individual prints, a goldfish, a tree, an origami crane, a coastline, a setting sun, an adobe structure, and a city street poetically overlap and curiously connect in the implied corner of an unidentified space. In another work, Nutini provides a meditative moment before the image 16,352 (2014), a reduction-relief mono-print titled for the number of visible pixels that he created with a grid carved into the wood by hand. Here, a spherical and a diamond-like shape float before a window or a portal, and an organic shape that resembles a body of water or a landscape seeps out below. Although all the elements in Corner and 16,352 are in a pictorial dialog, Nutini leaves their relationship intentionally unresolved, inviting our participation. On remembering a home, Bachelard noted that we dream of various places we have lived, and, similar to the pictorial experiences of Corner and 16,352, these places penetrate the imagination collectively. In other words, we do not remember spaces in an order; they arrive as a community of images in our minds, which we produce through the imagination’s translation of memory. Drawn from Nutini’s reservoir of digital imagery, Corner and 16,352, have six to eight image layers per print, conveying the effect of pictures layered atop pictures, composite upon composite, memory over memory. Their visual merging offers us a view into the way the whole of Nutini’s memory functions because it is analogous to how he remembers places and interprets experiences. Created from a print series, Corner conveys a mosaic of mementoes we meet simultaneously. The handmade pattern of the grid in 16,352 organizes slightly out-of-focus pixels in a state of becoming clear, a metaphor for memories from different time periods coming together. The overall effect Nutini crafts relates to one of Bachelard’s central questions. Bachelard wondered if an image conjured by poetic language could reveal the artist’s concentrated psyche and act on another’s mind. Bachelard found that this transsubjectivity could occur, but not through reference alone. We must have cause to consider the image’s initial formation when it arises in our consciousness, and only then could the imagination separate us from reality so we can revel in the journey the work of art ignites. Our imaginations engage as we attempt to translate the symbols in Corner and 16,352. In one of Corner’s images a tree’s branches faintly veil an adobe home, and in another print two round forms, perhaps an eclipsing sun and moon, seem suspended above a building-lined street. The images have either been cropped or left unclear and are thus not entirely recognizable, so they operate as a collective of memories coming to fruition. They will never come into sharp focus because we cannot clarify their respective relationships. Nutini’s symbolic composites look halted seconds before they take on a defined meaning. We contemplate the images a moment prior to their formation, before the inauguration of memory’s visual form. In Corner, Nutini challenges our understanding of time as it relates to memory. When we remember, time is not linear because the present is composed of various moments from the past. While making Corner, Nutini noted that he used an image from 2005, which in a way represents a “time locked [from] when I took it and when I used it…[my] personal time code.” The artist housed his time code in an ambiguous corner that intersects our space. We meet the recess of a room, yet we neither look up nor down to experience it. The room’s corner hovers directly before us as if turning in a different plane, dislodged and floating perpendicularly through the gallery space in which we find ourselves. Each image—a piece in the literal sense—opens to a portal of Nutini’s memory. He used many signs that we will not be able to decipher. The ambiguity of the symbolic reference holds a lot of power because through memory he revisits and reinterprets a plethora of symbols from any given time. Corner’s images represent his memory’s interpretative activity. The fragments of images appear paused a moment before clarity, in a state of apprehension and beyond language’s referential system. We can neither name one place’s relation to another, nor see where one image ends and another begins. The images slowly reveal a space composed of multiple places and sites woven together of several images—and a memory made of various time periods emerges. Nutini’s studio practice and visual end are inextricably connected as well. As we experience a series of his memories incised by his hand, we are met with creative ephemera. 16,352’s wood plate itself holds the memory of the artist’s process and is connected to the print’s effect. As Nutini works the wood block, he removes the material in multiple stages, never able to return to the initial image. Each pull on the press obliterates part of the previous form’s qualities to create the image anew. 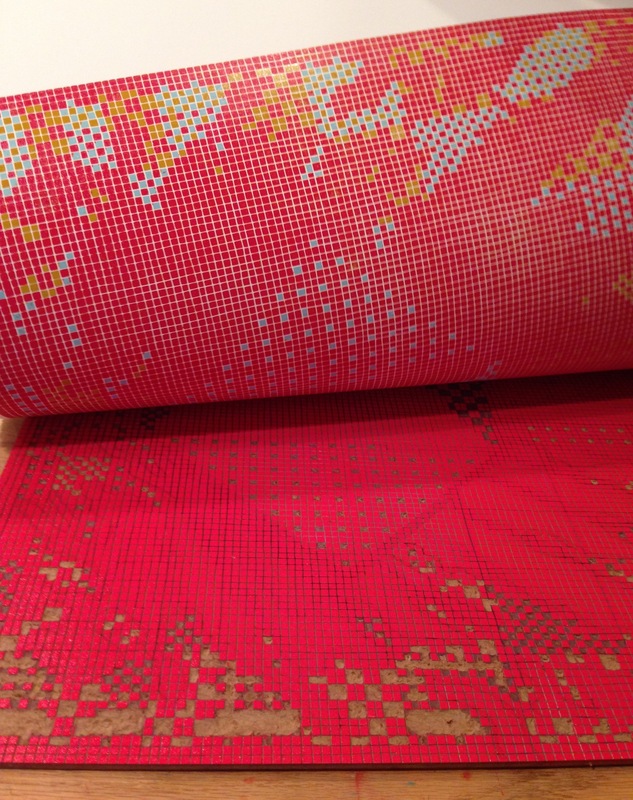 Although a print is supposed to work in duplicate, once it meets the press, he manipulates the plate again. Nutini created the topographical form at the bottom half of 16,352 through several layers of imagery and color, gouging away part of the plate after each layer. Since he carves away the wood as he goes along, he makes formal and color choices improvisationally, contemplating how one hue may look atop another and generating a print laden with the remains of his hand’s score. To him, his mark is a paramount aspect of his aesthetic. Leaving evidence of his craft conveys a “visual impact” that he “can’t get away from.” The print has traceable memories and the plate is like a chrysalis because in the shell “…you still have the little remnants of little memories of what the material was …[which is] analogous to the print having a plate and having a memory.” 16,352, similar to a chrysalis, holds the elements that make up its process of becoming. The print’s journey is visible in 16,352’s imperfectly straight grid lines. Despite Nutini’s carving, the grid’s imprint always remains as its channels run deeper than that of the sphere, portal or diamond shapes. The final composite reveals its own collection of memories, and we are observing both the formation of the object’s process and the subject’s—Nutini’s—memory. Both his working method and imagery represent the physical and metaphysical components of recollection. Nutini’s Chrysalis proposes that the image is not simply a metaphor of memory; it provides a perspective on the relationship between memory and the imagination’s faculty we may not have considered. Perhaps the boundaries we place on a particular time or place are fictionally constructed. Memories function in a constant state of becoming clear, separated from reality and the past by our imaginations. Our imaginations translate the symbols of moments past, so notions of memories are only as resolved as we deem them to be. And we compose a concept of self from the residue of past moments that merge and emerge in the recesses of our minds. she is writing her dissertation on Vincent Van Gogh’s Paris-period imagery. She is also an Assistant Professor at the University of the Arts where she teaches writing and art history. Gaston Bachelard, The Poetics of Space, trans. Maria Jolas (Boston: Beacon Press, 1994) 65. See also: Gaston Bachelard, La poétique de l’espace (Paris: Presses Universitaires de France, 1970) 71. In the first and second sentence, I paraphrased poet and critic Charles Baudelaire’s “Correspondances” published in Les Fleurs du mal (1857). For the poem and an English translation, see: Charles Baudelaire, The Flowers of Evil and Paris Spleen: Poems by Charles Baudelaire, trans. William H. Crosby (Brockport, NY: BOA Edition, Ltd., 1991) 28-31. 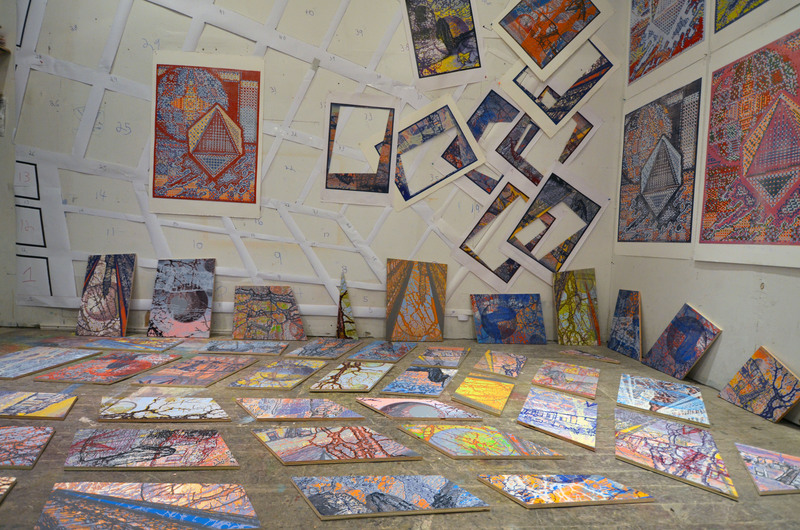 Alexis Hugo Nutini, studio visit with the author, 2 January 2014. Alexis Hugo Nutini, studio visit with the author, 15 February 2014.